Braun Thermometers IRT-6020 from Braun Thermometers on Vimeo. When it comes to accurately taking a child’s temperature, doctors trust the precise Braun ThermoScan® ear thermometer above all others*, thanks to its patented, pre-warmed soft tip. The tip on other thermometers can cool the area where the reading is taken, which can lead to inaccurate readings. The tip on the Braun Thermoscan® IRT 6020 Ear Thermometer is warmed before use to prevent this and ensure professional accuracy. In addition, the ExacTemp® guidance system confirms the correct position and accurate reading with a light and a beep. You will also appreciate disposable Braun certified lens filters that help prevent the spread of germs between uses. 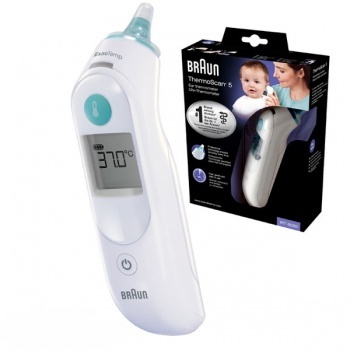 And now with the new large screen and ergonomic design, Braun Thermoscan® IRT 6020 Ear Thermometer is even simpler to use. Discover why the Braun ThermoScan® is the No. 1 brand among doctors.